Happiness is everywhere you look right now, isn’t it? And I don’t mean REAL happiness – but as a topic of discussion. It’s the primary focus of the zeitgeist – popping up everywhere in books, films and songs. 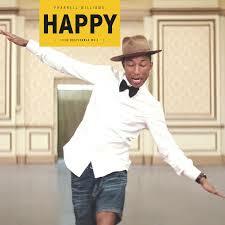 Just look at Oscar nominee for Best Original song, Pharrell Williams with his catchy ditty, Happy. It’s a pretty tall order. How is it even remotely possible for happiness to be provided for EVERY PERSON IN THE WORLD???? Dig a bit deeper and you’ll find the United Nations is really hoping every country will get behind the initiative by providing seminars and awareness days that will encourage and generate general happiness. You see, happiness is no longer just a state of mind. It’s now a bona fide science and moneymaking industry. In the US, there’s a Happiness 1st Institute, an International Society of Happiness Professionals and even a Harvard University Psychology course titled, ‘Happiness 101’. Unwittingly, I’ve drawn a minor study of the notion of happiness this year by taking on some reading material that focuses on happiness and success. So I thought I’d do my bit for the United Nations by sharing with you a quick summary of three books you might like to take a closer look at. I’m not one of these New Age types who have a fetish for self-help books, but have found these three books to have practical tips and advice that really can make a difference. 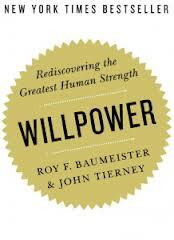 (1) The first book I took on this year, which I’ve discussed briefly in an earlier blog, is WILLPOWER by Roy F. Baumeister and John Tierney. I was drawn to this title in an airport bookstore while wondering how to conquer my brilliant talent for procrastination. It seemed timely that this popped in to view, so I decided to buy a copy. This book draws on a vast range of psychology studies and research to illustrate valid points about willpower and how better planning strategies and time management help bring about a less stressful life. (2) The second book I tackled is called Life In Half A Second by Matthew Michalewicz. This was sent to me by Michalewicz himself and arrived out of the blue. 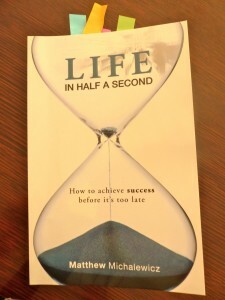 Again, as a talented procrastinator, I was drawn to the sub-title ‘How to achieve success before it’s too late.’ I was skeptical, but thought I’d scan through it to see if it had any merit. As you can see from the coloured markers, there are plenty of pages I want to return to because of the advice offered. The best part about this book is that Michalewicz instructs the reader to complete specific tasks at the end of each chapter to ensure you are on the right path. ‘By knowing exactly what you want, wanting it badly and believing you can get it, you have primed your mind for success. You have given yourself the absolute best possible chance of achieving your goals. Clarity, desire and belief are working together on your behalf, night and day in your subconscious. You have presented your mind with a tangible, concrete problem: How can I get what I want? How can I achieve my goals? MAIN POINT: Write down your goals with a time frame for achievement, focus on them daily and stay positive. (3) The third book was recommended to me by a girlfriend (thanks, Sal!) 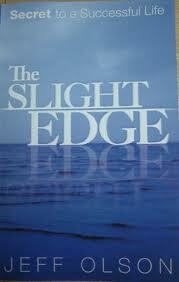 and is called The Slight Edge by Jeff Olsen. I love this book because it doesn’t make any wild proclamations about delivering AMAAAZING results in weeks. In fact, it spouts a message that’s completely the opposite. This book is all about taking lots of small steps every day to achieve your goals and to find happiness. Like the book Willpower, it also draws on wide-ranging psychological studies and research to prove its point. Of all the books, this one is the most concerned with finding happiness. The philosophy it draws on is, of course, called ‘The Slight Edge’. 1. To write down 3 things you are grateful for every day. 2. Journal for 2 minutes a day about a positive experience you’ve had in the last 24 hours. 4. Do a random act of kindness every day. 5. Exercise for 15 minutes a day. On a final note – a tip from me. Looking at happy photos will always give you a happiness boost. My favourite is this one of myself and my daughter, Veronica, when she was having a swimming lesson, aged 9 months. Her face says it all. Pure joy. Happy International Happiness Day to all!